Well, drinking cider really takes me back to my student days, although the cider we drank back then, was nothing like this nectar! You could probably strip paint with the cider we used to drink! Price was the main concern, It was cheap! I am usually a wine drinker, but something made me stop in my tracks at the cider shelf. So I have had this little gem cooling, for a few days in the fridge. I came home from a lovely lunch with Graham and my parents (in honour of Father's Day, unfortunately we couldn't take Graham's mum and dad as they have moved somewhere hot! )and the sun was actually making an appearance, so I was straight out in the garden with a glass of cider and my book! 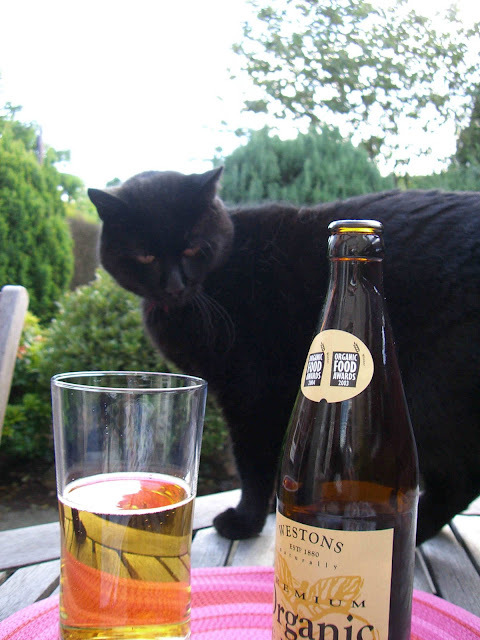 We won't mention the change of glass to make the photos look better and the time spent trying to get a photo of the cat, while he viewed the cider in complete mystery and disgust! Anyway, the cider was really soft, with a lovely appley bite and no catching in the back of the throat. It smelled gorgeous too! I would definitely recommend this one! It is made by Westons, in Herefordshire, in a village called Much Marcle (great name!). 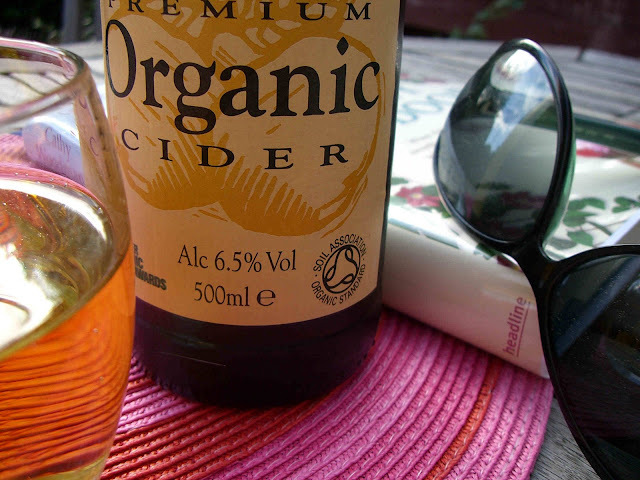 It is organic, suitable for vegetarians, vegans, coeliacs and has won a few Organic Food Awards. It is endorsed by the Soil Asscoiation , that was enough to persuade me to try it! Disclosure: I bought this cider myself. Funny. I'm just starting to enjoy cider again. My student days (cider & black) put me off it for a long time! Hi Wendy, I am not particularly fond of beer, but I am willing to give it a go, in the name of research! I never liked blackcurrant in cider, but I remember it was a killer, if someone spilt some on you! Do you remember snake bit (cider & lager mixed)? Now, that was a lethal combination! PS. good luck with the baking for the Highland Games Wendy! OK, you have one on me. I have never had cider. Is it sweet? I have had apple cider. Is it like that? I will check this one out! Great photo in the garden! And your kitty reminds me of mine, except yours is lots bigger! Fang is an old lady and does not do alot of jumping up anymore, unless she really wants something special. Her hips are starting to give her a bit of a problem. I think she is on her 18th life! Hi Winedeb, It probably is the same as what you refer to as apple cider. It is traditionally brewed here in oak barrels and quite often made by hand. You really have to visit England for Good Cider! Two of my cats look quite like fang! But Kia is definitely a much fatter version. He is built like a tank and does not move when he is in the way, but digs in right where he stands. I quite often fall over him! Now Wendy, it sounds like you have a tale or two of misspent youth! Spill! Huge thanks for the fruit cake recipe, Holler. I made it this evening and it is divine! Have posted the recipe in your own words on my site today with a link back to Tinned Tomatoes. That sounds so good! I love cider, it was all I drank when I was in Scotland and Ireland! Love the kitty! Hi Jenn, It sounds like you had a rare time on your travels! I was asking Wendy to spill the beans on her wild nights out on the cider, but maybe I should ask you! The photo of your cat's look... that is priceless. i cracked up after reading your words about what he'd look like - mystery and disgust - and then the actual photo!! TOO FUNNY!! i don't drink much fruit juice or alcohol but i do love cider on occasion! This looks great. i also laughed about your reminiscing about the cider you used to drink... stripping paint!! Thanks for the smiles with this post... good one! Ooh! Thanks Kleopatra, you are a sweetheart! The photo is very representitve though! Kia is very suspicious of everything! Curiosity certainly never got this cat. He prowls around anything new, at a very safe distance, scowls at it alot and then might cautiously stretch out a paw to give it a tap!